I just came back from my ski holidays in Austria and before I start depicting all the fabulous Tyrolean dishes that Lucas and I gorged on, I will finish up the Argan oil story. The first time I read something about Argan oil was not too long ago, in a book called In Bad Taste? The Adventures and Science behind Food Delicacies written by Prof. Massimo Marcone. Turns out that the Argan tree has thorns that make it difficult to reach the fruit that contains the seeds for the production of the oil. This is why, the Berber people would collect the undigested seeds from the feces of goats which climb the trees to eat the Argan fruits. These seeds are then ground and pressed to make the oil. Ever since I came to know this, I couldn’t wait to go to Morocco to get some poop oil. 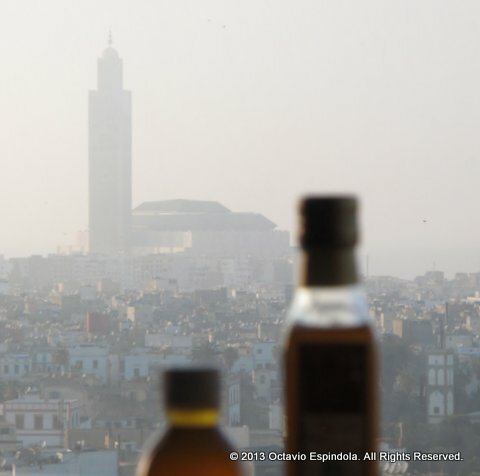 Last month I finally got the chance to go to Casablanca. Excited about this opportunity I did a bit of research on the internet to see if there was some kind of information on where to find the oil, but I was disappointed to see that the only information there is, is about spas and beauty saloons that use the oil for cosmetic purposes. Unfortunately, this was not going to be the last disappointment. 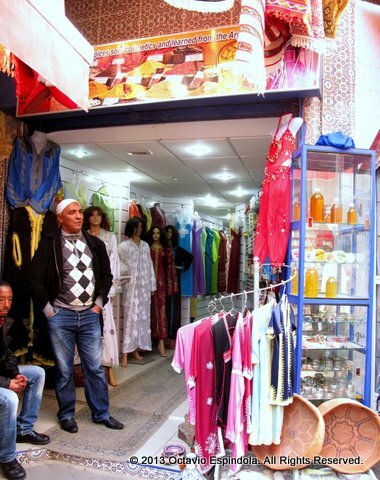 On the way to Casablanca, talking to a Moroccan colleague (locals are always a good source) I found out that you can find the Argan oil in “many stores”, although most of them are probably diluted or adulterated somehow. The fact that you can find it in many stores, as he said, was a bit disturbing. I had imagine myself on an adventure, hunting for the gold of the desert. To top it all up, at least five of my non-Moroccan female colleagues wanted to buy the cosmetic oil. They all knew about it. How come did I not know that it was such a boom? Not willing to give up to the idea of an adventure, as soon as I got to the hotel I asked the concierge if he knew where could I find the oil. His reply ended up crashing all remaining hope. “You can get it at the gift shop across the street” he said. That was it, there was not going to be an adventure as I had imagined. The bitter reality is that it is the new Aloe Vera or Snail Serum in cosmetics and they sell it in “gift shops”. Completely disappointed I left the hotel, crossed the street and went into the gift shop to see what it was all about. 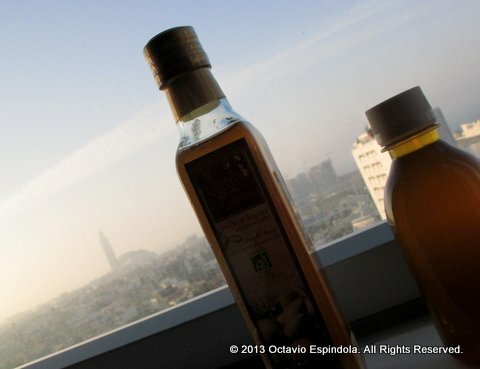 Tons of small bottles of cosmetic Argan oil were displayed on a dirty shelf, but what about the edible Argan oil? According to the guy from the shop – who didn’t have any – I would have to “really look for it”. Those words were comforting. A hint of adventure at last! With a bit of recovered hope I set off to Old Medina Market. Despite everything, I was not willing to go back empty-handed. 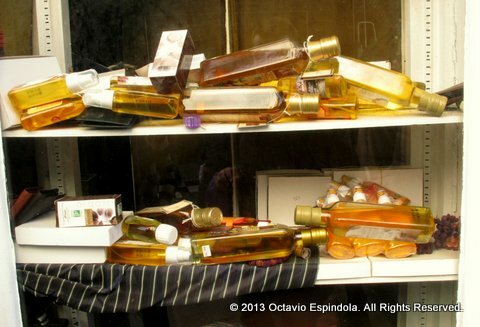 I walked around for a long time, seeing nothing but clothes, leather bags, jackets, shoes and hundreds of other things that I was not looking for; until I finally look out of the corner of my eye a shop-window displaying edible Argan oil on a shelf even dirtier than that at the gift shop. I went inside and bought my first 250 ml bottle of liquid Moroccan gold for the modest price – after bargaining that is – of 180 Moroccan dirham (MAD) or 16 Euros . 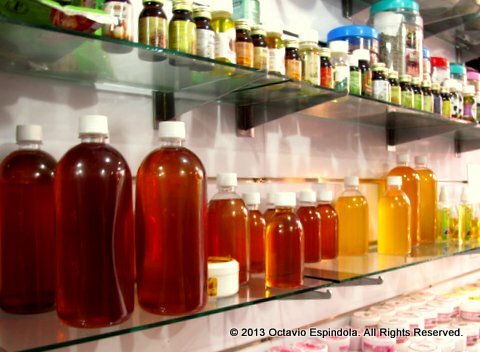 As I kept on walking around the narrow passageways of Old Medina Market I found another store selling Argan oil. But this store was different. It was clean and the oil was bottled but not labeled, which I thought it gives it a more crafted look. I had already I come to terms with the idea that I would never know the difference between the pure and the diluted or adulterated oil, so I bought one of the not-labeled 250 ml bottles. At least this way I would be able to compare. This time the bargaining took a bit more effort, but I got it for 250 MAD, around 23 Euros. With little money left to spend, but absolutely happy with my new acquisition I went back to my hotel. The next day, at Casablanca’s airport waiting for my flight to depart, I found a shop that sold all sorts of Argan oil products including the culinary version and inside the shop were all my colleagues, male and female alike. Until that moment I had been happy, but unsure. I had that feeling of having been scammed but not really wanting to think about it. It all faded when I saw my colleagues buying the exact same bottle of oil that I had purchased for 180 MAD for double the price. Then it hit me. 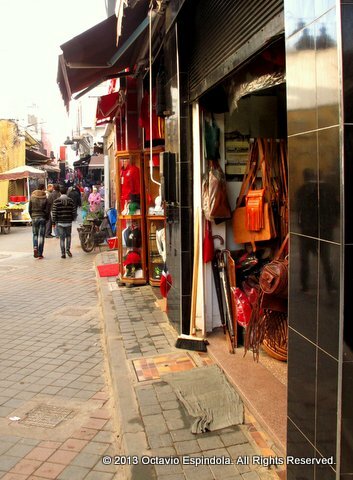 I had ventured to the streets of Casablanca in search of gold and I was going home with the prize.